This mangled wreck was the result of a motorist being almost twice the drink-drive limit. Gareth Hemingway was behind the wheel of the Renault Scenic when it collided with a tree and a telegraph pole on the A286 at Singleton, near Chichester, about 2.30am on Monday 22 January. When police found him with a female passenger at a bus stop about a quarter of a mile away from the scene , he initially denied being responsible, police say. But he later admitted the offence after German Shepherd Police Dog Vinnie led his handler PC Paul House directly to where the pair had been. They were both uninjured. PC House said: “I arrived at the scene of the crash and took PD Vinnie to the vehicle, where he could associate himself with any scents. “I then cast him away from the scene and he almost immediately indicated a track south along the road and verges of the A286. Hemingway, 37, unemployed, of Manor Farm Court, Selsey, was subsequently arrested and charged with driving with 69mcg of alcohol per 100ml of breath in his system. 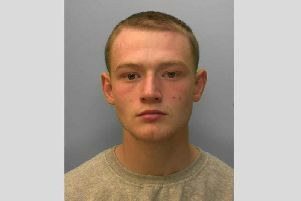 At Worthing Magistrates’ Court last Tuesday he was disqualified from driving for 20 months. He was also fined £339, and ordered to pay £85 costs and a £33 victim surcharge. Arresting officer PC Anthony Williams, of the Chichester Response Unit, said: “Hemingway’s decision to drive while almost twice the legal limit was extremely irresponsible, and it’s a decision he no doubt regrets. “These images demonstrate the consequences such actions can have, and it’s fortunate neither he nor his passenger were seriously injured.